Does a Fairbanks winter vacation make you think "snow?" "DARK!" or "Northern Lights?" For most people, winter helps define Alaska. So winter is great time for your Fairbanks vacation. 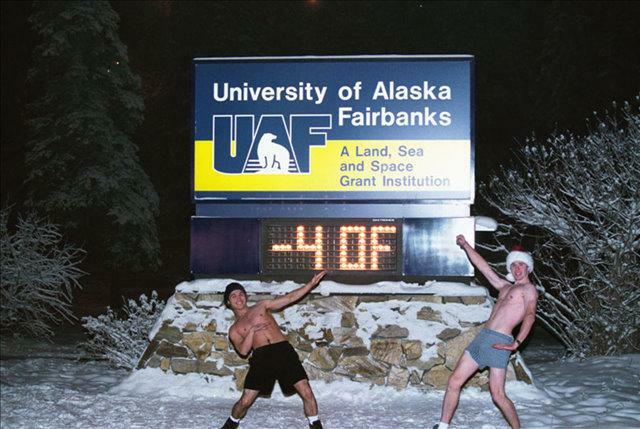 Not everyone is as goofy as these UAF students! But Fairbanksans do have wonderful winter adventures and lots of fun in Fairbanks. And so can you .... so MANY things to do! There is magic in the wintertime of Fairbanks Alaska. The magic is discovering all the interests, passions, and activities that are within you, and available when you take your Fairbanks winter vacation! You will love your winter vacation in Interior Alaska. Let me tell you about some of wonderful, fun things for you to do on your winter adventure! Fairbanks Alaska, is known among competitive cross-country skiers as the best early-season snow in the country. But skiers of all levels have a blast on our well groomed local trails, often until late April. The trails at UAF and Birch Hill are not only nicely groomed, but they are well lit! As an added bonus when your winter activity is a cross country ski jaunt on the Boreal Forest trails at Creamer's Field, you can do some birdwatching! Look for Boreal Chickadees and Pine Grosbeak among others... and listen for the Great Horned Owl and the Downy and Hairy Woodpeckers! You can even rent skis at the UAF Wood Center Outdoor Adventure Program if you don't have room to pack them. In fact, you can rent most of your outdoor gear at the Wood Center. Now, THIS is a winter adventure in Fairbanks Alaska! I discovered winter cycling a couple of years ago; it is a so much fun, and it gets me out in the winter sun! Yes... there is sun in Fairbanks in the winter! Plus, winter cycling saves me a ton of money in gas! Worried about a little cold? the dark? Not a problem, like Alaskans always say, "just add another layer" (and get a headlamp for your helmet and flashers for bike). In fact, the only real problem might be overheating! Pay attention to how you pack for your Fairbanks winter vacation. 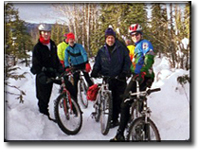 The Fairbanks Cycle Club has a great website to help you get equipped and learn about their regular winter rides. 110 ice sculptors compete in the Fairbanks World Ice Championship . Traveling from Poland and Hungary, to Japan and Mexico (and Interior Alaska, of course! ), they worked with Fairbanks' world famous, transparent ice blocks weighing up to 7,500 pounds each! The ice blocks are "harvested" from a pond right next to the ice park. Kids play on sculptures like the giant ice slides, the ice-go-round, and a full sized ice cabin! But the real fun is in the carving. Both adults and juniors can take ice carving classes that last from a couple of hours to 2 weeks. Give it a try while you are here for your Fairbanks winter vacation. Curling is a very old sport, a little like shuffle board or darts, only teams play with a giant granite stone that they "sweep" over the ice toward the target. The Fairbanks Curling Club is the oldest organized sports group in Alaska. They celebrated their centennial in 2005. Curling is a popular family activity in Fairbanks. Adults and juniors alike love to this sport, and you can try your hand at it while you are vacationing during a Fairbanks winter. Just contact the curling club through their website. There are lots of opportunities to observe local curling games. The spectator gallery is heated to a comfortable 68 degrees with free admission, and there is a nice little bar! Curling season runs late September through early April. In the winter in Fairbanks there are usually several formal dance events. Two of the most fun are the Symphony Ball in November, co-hosted by the Fairbanks Symphony Association and The Ballroom Dance Club of Fairbanks, and the Starlight Ball in February, also put on by the Ballroom Dance Club of Fairbanks. Click to check out the series of dance opportunity pages on this site. Does your dream vacation in Alaska include the winter adventure and thrill of flying across the snow covered landscape behind a team of powerful sled dogs! You can! Lots of visitors have heard of the Yukon Quest and think that only the hardiest of souls would ever even try mushing; Not So! You can take a 1/2 hour tour, an overnight trip, or a week-long trek across the tundra with a Fairbanksan like professional musher Kathy Lenniger. You can also go to Dog Sledding School while you are in Fairbanks Alaska! Honestly! Snow Machining Like you've never (EVER!) done Before! Alaska is the biggest playground you can imagine! If you have a need for speed, you'll want to get out into the Alaskan wilderness, and ride across it on a snow machine (often called "Snow Mobile" in other parts of the world). Even if you're a seasoned rider, this is a winter adventure you'll never forget! Of course you need the right equipment. Alaska Snowmachine Adventures is one of the family owned businesses (located in North Pole)that will rent it to you if you didn't bring yours with you! WELL! You get the picture! NOTHING stops Fairbanksans from adventuring in Alaska. Contact us for more information about the good times to be had in Fairbanks!